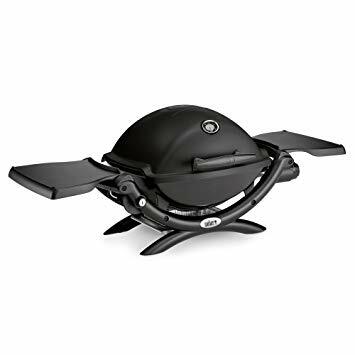 Hello there, Today we're going to make another comparison among the two very popular grills by the brand Weber which are Weber Q1000 vs Q1200. We'll be talking about its models launched by the name of Q-series. Weber Q series gas grills are a great launch by the company. It delivers top class performance and is also built with high-quality materials. Today we'll compare its Q1000 and Q1200 model. Both the models offer similar grilling experience with just minor differences. Before going ahead for the comparison, we would like to clear few things. Look, it'll be not fair if we declare one model as a winner. The reason for this is quite obvious. Everyone has different requirements, different budget, and preferences so it's all upon you to make a final call. But we make sure that the comparison of Weber Q1000 vs Q1200 listed below will surely help you in finding the best. 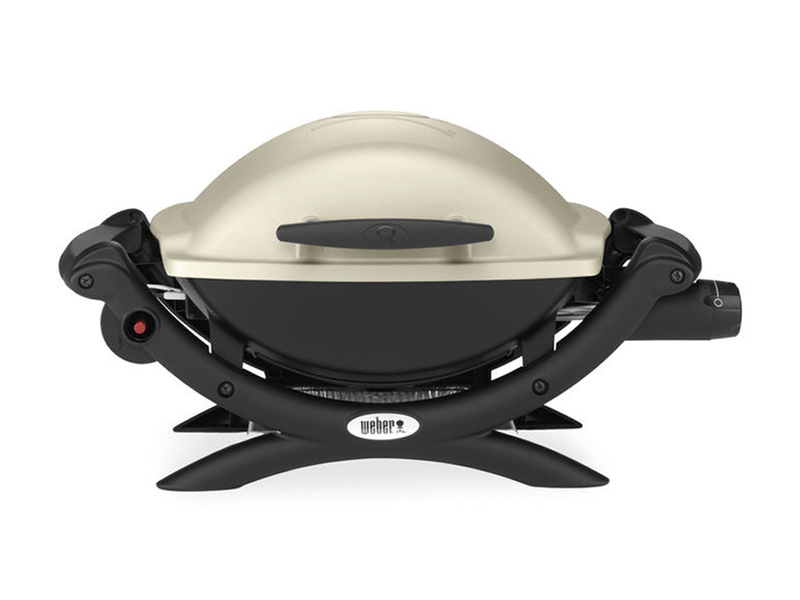 Weber Q1000 is one of the cheapest plus portable gas grill available. Besides its beautiful appearance, the grill also looks simple. It comes with one stainless steel burner that yields total heat output of 8500 BTU. Talking about cooking surface, here you get a sufficient space of 189 square inches. It uses a push-button ignition and 14.1 or 16.4 oz. LP cylinders sold separately. For better and even heat distribution, it has porcelain-enamel cast iron grates which are made for this purpose only. It comes with an electric ignition source. Talking about heat output, it has a capacity of 8,500 BTUs which can be operated over a cooking surface area of 189 square inches. This device is available in different colors, so you can choose one out of your favorites. There's also a side table attached with the unit that can be taken in use during cooking. You'll find a built-in temperature gauge which is missing in Q1000 model. You'll be happy to read that both the models have no difference under this segment. Both have the same cooking area of 189 square inches. Under this area, it is concluded that you can easily grill for about four people. 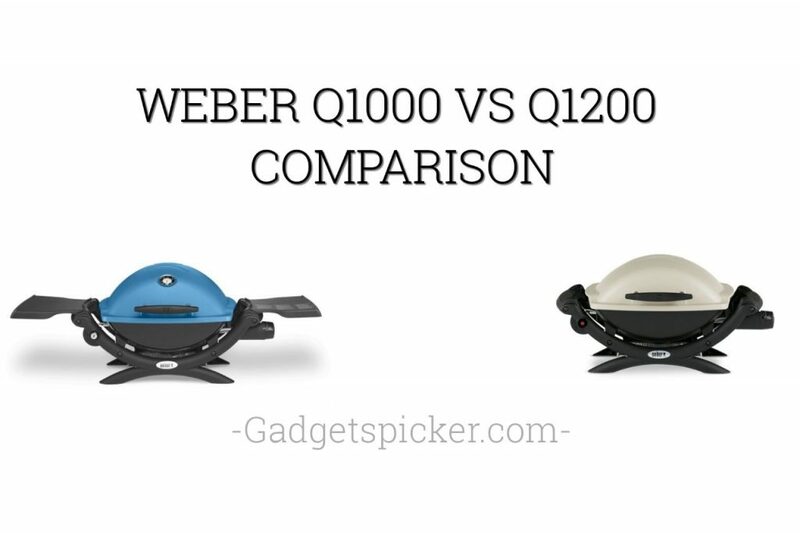 Here also, buyer's will not notice much difference between Weber Q1000 vs Q1200, as many features and factors are common among this two models. Talking about specs, user's will get only one stainless steel burner with both the models. Moreover, they'll get same heat output of 8500 BTU, from each of the burners. Regarding performance, stainless steel burner plus 8500 BTU of output grills perfect. Where you'll spot the difference is their ignition system. Q1000 comes with Push Button ignition system, whereas Q1200 comes with the Electronic ignition system. Talking about cooking grates, again you'll not find any difference here as both the models come with porcelain-enameled cast-iron cooking grates. Both, Q1000 and Q1200 large grip handles and ergonomic side handles for easy holdings. The difference is the folding side tables, which users will get in the Q1200 model. Side tables are very useful for keeping foodstuff or utensils, during grilling. Also, in Q1200 users get an inbuilt thermometer whose role is to display the temperature of the interiors. Talking about build quality, both the models have Cast Aluminum lid plus body and have removable catch pan glass. Besides this, both have Glass Reinforced nylon France and also comes with a painted lid. If you're interested in adding colors to your grilling world and want to experience the best, then Q1200 will do the job for you. Q1000 is available only in white color. Whereas Q1200 gives freedom to the users for choosing among white, black, fuchsia, blue, green, orange, purple colors. So you can pick anyone from the available colors.